Fourth Row Center: Film Writings by Jason Bailey: New on Blu: "Kelly's Heroes/Where Eagles Dare"
When Quentin Tarantino released Inglourious Basterds last year, much was made of his desire to make it fit within a very specific subgenre: the “World War II guys on a mission” movie. It sounds like a strangely esoteric classification, but there were actually quite a number of these films, most of them released on the heels of the phenomenal success of The Dirty Dozen, the standard bearer of the bunch (though it was preceded by The Great Escape, The Guns of Navarone, and others). The late 1960s and 1970s saw such similarly-minded films as The Bridge at Remagen, The Eagle Has Landed, The Inglorious Bastards (the Italian film from which QT “borrowed” his title), and the Clint Eastwood films Kelly’s Heroes and Where Eagles Dare, collected in a new Blu-ray double feature. The two films share a star, a setting, a story type, a director (Brian G. Hutton); they even use the same title font. Kelly’s Heroes is the better-known picture today, primarily for its comic overtones—it was released in summer of 1970, just a couple of months after the surprise success of M*A*S*H, and was pitched to audiences as a cross between the standard WWII adventure yarn and the antiauthoritarian irreverence of Altman’s comedy (with that film’s star, Donald Sutherland, along for the ride). Eastwood plays the title character, a busted-down lieutenant who, while interrogating a German colonel, finds out about a treasure trove of Hitler’s gold stashed deep into France, behind enemy lines. Taking advantage of a brief bit of company R&R, Kelly puts together a motley crew of fellow soldiers to swipe the gold. 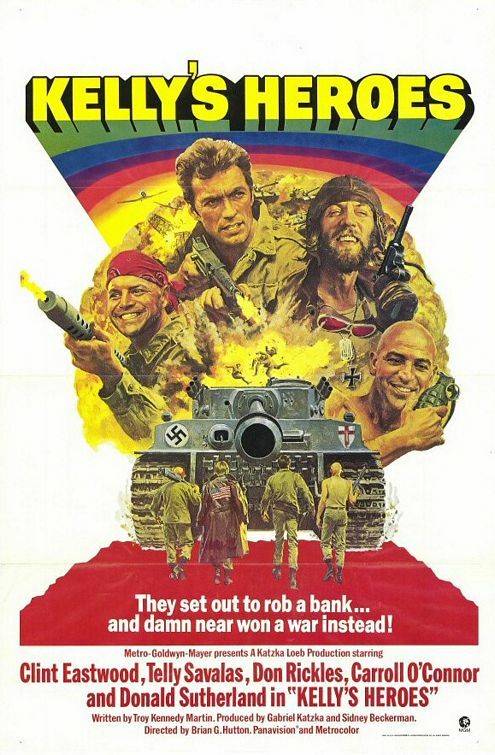 There’s Big Joe (Telly Savalas), the resentful master sergeant; opportunistic hustler/supply sergeant “Crapgame” (Don Rickles); Sherman tank commander—and strangely ahead-of-his-time hippie—“Oddball” (Sutherland); and an assortment of platoon members and tank mechanics. Kelly’s Heroes runs a rather bloated 144 minutes, though you can mostly feel it crawling in the first act; it takes too damned long to get cooking. The picture’s primary flaw, however, is that director Hutton can’t find a consistent tone and sustain it—the serious action and plotting scenes coexist uneasily with the comic ones, leaving the funny stuff to feel like disconnected “comic relief.” Mixing comedy and action is harder than it looks, and Hutton’s occasional attempts to do so (like the attack on a German camp underscored by Oddball’s gang listening to a Hank Williams Jr. song) are too lead-footed to play. Frankly, the film works best as a straight-forward military adventure, as in the tense minefield scene, or the heist sequence, which is well-constructed and tightly shot. It does conclude with a nice inside joke; as Eastwood goes to face down the German soldier in a tank, Lalo Schifrin’s score kicks up a cue that’s a dead ringer for Morricone (Savalas and Sutherland join Eastwood shortly, apparently filling the roles of the bad and the ugly). That moment almost makes up for the multiple uses of “Burning Bridges,” an anachronistic up-with-people number sung by “The Mike Curb Congregation”. Speaking of anachronistic, what are we to make of Sutherland’s hippie soldier turn? It’s a clear pander to the lucrative “youth market,” but Sutherland managed to play a modern-thinking character in M*A*S*H without resorting to literally sporting long hair and a beard and talking like Dennis Hopper; worse than that, by the end of the picture the sniggering self-indulgence of the performance has made him more irritating than amusing. Savalas and Rickles come off best in the cast—the former finding some nuance in his no-nonsense character, the latter expectedly funny while still restrained and in-character. Caroll O’Connor, a year away from Archie Bunker, doesn’t get much to do, while Eastwood ends up playing the straight man, and consequently kind of disappears. What’s more, we never really get to know anyone we didn’t know beforehand; the platoon all blends together, in spite of the presence of a few recognizable faces (including Harry Dean Stanton, billed only as “Dean Stanton,” confirming that he has always looked old, even when he was young). Kelly’s Heroes comes to a satisfying conclusion (there is one truly perfect smash cut), but it is a mostly uneven film, struggling mightily to reconcile its old-fashioned storytelling with the more modern sensibilities that were creeping into contemporary cinema. Where Eagles Dare, which director Hutton and star Eastwood made two years previous, isn’t burdened with the chore of hipness—it’s straightforward yarn, and a pretty good one. Hutton’s pacing remains a bit stoic and staid, but it’s a smoother fit with this more straight-faced story. It’s a longer film than Kelly’s, but doesn’t dither around so much—Hutton gets right down to business, with one of those “righty-o, here’s the plan” scenes led by a British officer (which Tarantino was semi-parodying with the Mike Myers bit in Basterds). The mission for the team of British commandos, plus a U.S. Army Ranger (Eastwood), is to penetrate a fortress high in the Alps to retrieve an important brigadier general who has been captured by German forces. But something else is amiss; members of the team start turning up dead, and we begin to suspect that the leader of the mission, Major John Smith (Richard Burton), may be up to more than he’s telling. There’s only one major prolem with the film, though it is a whopper. This is one of those movies where everyone speaks English, though the Germans speak English with a German accent. Trouble is, when the British-American team infiltrates the fortress, wearing German uniforms and masquerading as German officers, not only do they not speak German, they… still speak with their English and American accents. Not to sound too literal, but isn’t that a bit of a giveaway? No matter. Again, not much of Clint’s personality comes through here—he’s fairly bland, allowing Burton and his crisp, engrossing professionalism to take over the movie. That holds particularly true in the lengthy centerpiece scene, in which the two men take over the German interrogation of the general; Burton flips the scene’s script several times, shifting allegiances and purposes, the character improvising brilliantly. Poor Clint, on the other hand, suffers the ultimate indignity of getting beat up by a couple of wussy Brits, leaving him passed out while Burton gets the picture’s best action sequence—a daring, white-knuckle fight atop an escaping cable car. The writing by Alistair MacLean is sharp and twisty, dense but not confusing. As with Kelly’s Heroes, Where Eagles Dare pulls itself together best in its third act, with the thrilling escape sequence—this is where Hutton is doing his best work, building his action beats in a brisk, workmanlike fashion. Neither Kelly’s Heroes nor Where Eagles Dare represents the best of this very specific type of WWII movie, nor a full realization of Eastwood’s particular talents. But both films (particularly the latter) are pretty decent popcorn entertainments—nothing more, nothing less. Warner's "Action Double Feature" Blu-ray of "Kelly's Heroes" and "Where Eagles Dare" streets on Tuesday, June 1st. For full A/V and bonus feature details, read this review on DVD Talk.